Hold down the Option key when you have selected a person’s record in the Name column to see what groups that person is in. 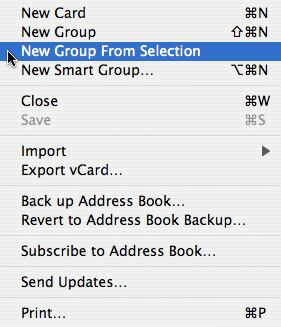 A quick way to create a new group is to choose File –> New Group From Selection. 1. Make sure you are in Cards and Columns mode by pressing COMMAND-1 (see Figure 1). 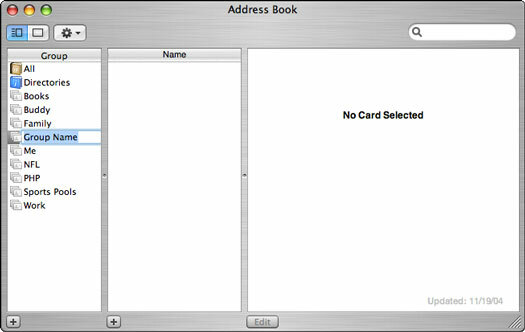 Address Book supports three modes (all available through the View menu): Cards and Columns, Card Only, and Directories. Cards and Columns is the best for creating groups. 2. Click the All option under Group to display every record. 3. COMMAND-click the names listed in the Name column to select the group members. 4. Choose File –> New Group From Selection (see Figure 2). A new group is created in the Group column. This new group’s name (“Group Name” by default) is highlighted, ready for you to type the new name. 5. Enter the new group’s name. 6. Press Return to complete the transaction. 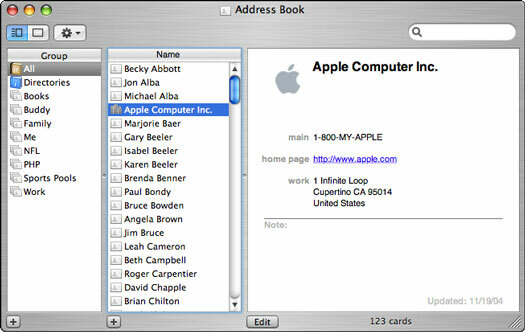 Figure 1: Address Book’s Cards and Columns mode. Figure 2: The New Group From Selection option eases the group creation process. 1. Make sure that you’re in Cards and Columns view mode; choose it from the View menu or press COMMAND-1. 2. Click the plus sign in the lower-left corner to create a new group. 3. Type the new group’s name in the new, highlighted field that appears (see Figure 3). 4. Search or browse through the Address Book names, adding people to the new group by dragging their cards onto the group name. To delete a group member, select the member’s name from under the Group listing and then press Delete. Press Return at the prompt that appears (see Figure 4) to remove the user only from this group (not from the whole Address Book). Figure 3: When you add a new group, it’s given a default name that you can easily change. Figure 4: When you delete a user from a group, you have to clarify your intentions. 1. Select the existing group in the Group listing (the left column). 2. Choose Edit –> Copy or press COMMAND-C.
3. Choose Edit –> Paste or press COMMAND-V to create a copy of that group. 4. Rename the new group (called Old Group Name copy) by double-clicking the group’s name. 5. Edit the group’s members by using the steps outlined in the preceding section.